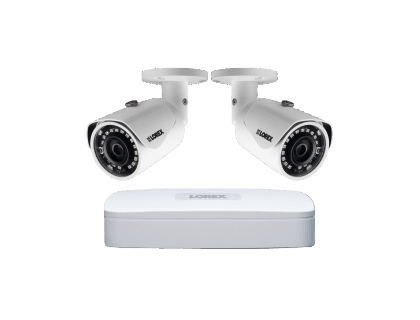 Learn about the Lorex HD Security Camera System with 2K Recorder Weatherproof Cameras. Includes pricing, features, and FAQs. The Lorex HD Security Camera System with 2K Recorder Weatherproof Cameras features color night vision and HDR technology for enhanced image clarity. This Lorex security camera system is also vandal-proof for added security. HD NVR supports up to 4 cameras. 2 × 4MP HD bullet cameras. Pros: Plug-and-play installation, easy to use, and great picture quality. Cons: Quality of cables deteriorates after some time. Bottomline: A good entry-level security camera system with color night vision and excellent image quality. What are some alternatives to the Lorex HD Security Camera System with 2K Recorder Weatherproof Cameras? Where can I buy the Lorex HD Security Camera System with 2K Recorder Weatherproof Camera? You can buy the Lorex HD Security Camera System with 2K Recorder Weatherproof Cameras via Amazon or directly from Lorex. Does the Lorex HD Security Camera System with 2K Recorder Weatherproof Cameras work at night? Yes, the Lorex HD Security Camera System with 2K Recorder Weatherproof Cameras features Color Night Vision and True High Dynamic Range (HDR) technology, which provides enhanced image clarity in all lighting conditions. Can the Lorex HD Security Camera System with 2K Recorder Weatherproof Cameras be used in any weather? The Lorex HD Security Camera System with 2K Recorder Weatherproof Cameras is IP66-rated, and is able to withstand temperatures as low as -22 °F.